For those arriving Friday, join us upstairs at World Cafe Live for a bit of Philly love! Cash bar and menu available – and the KindieComm Registration table will be open so you can grab your name badge and check in! Having heard the requests at past gatherings, we’ve created a dedicated space where you can join other KindieComm attendees and perform one of your songs for welcoming ears. This peer event will be supervised by Karen Kalafatas (Karen K and The Jitterbugs), Devin Walker (The Uncle Devin Show) and Ann Torralba (Little Miss Ann) who will keep things moving smoothly. Karen is graciously bringing a small sound system along with a few mics/stands and cables. Each musician will get five minutes to share a song of theirs with the room. Keep that in mind when choosing which song you want to play – easy in, easy out. If you’d rather, you can sing to track to demonstrate the full sound of the song you’re performing. We’ll provide an RCA to 1/8″ cable so you can plug directly into your smartphone/tablet/laptop. Bottom line – treat this like an open mic – be ready to plug and play! The KindieComm SongShare will be located in the Fairmount Suite within the Sheraton University City hotel (host hotel for KindieComm) at 36th and Chestnut Sts. There will also be a cash bar within the suite to whet your whistle! Click the SongShare / Kindie Cafe tab at the top of the page to sign up in advance! We begin KindieComm with Kathy O’Connell and our special morning guest, Trout Fishing In America. On the eve of celebrating their 40th anniversary as a dynamic duo, Keith Grimwood and Ezra Idlet have been at the forefront of kindie music, having performed for kids and families since the 1980s. Their debut kids album ‘Big Trouble’ was released to critical acclaim in 1990 and there’s been no looking back since! Trout Fishing in America was in the first wave of artist owned labels (Trout Records) to successfully record and market their own music. Their recordings have garnered three National Indie Awards, multiple Parents Choice and NAPPA Gold awards, the American Library Award, as well as four GRAMMY nominations. Since the beginning, Keith and Ezra have played shows for kids as well as adults. Sharing knowledge and encouraging art has become another musical mission of TFIA. In the past few years, they have developed a variety of songwriting workshops for teachers and students that illustrate how art and music come from the fabric of everyday life. Their willingness to make fun of our most annoying habits in one song, then touch our hearts with tender and passionate images of family life in the next is what makes the connection between Trout Fishing in America and their audience so real. One of the highlights of past KindieComm gatherings was the chance to meet, network and simply connect with other performers in the kindie genre. During this session Kathy will introduce you to some of the musicians that have carved a niche for themselves in the kindie community. They WANT to meet you and learn what you do – so this is the first step … get to meet THEM! Afterward, feel free to chat them up – they might have some advice that can help you grow as a kindie performer. We are beyond excited to announce that our special VIP guests for KindieComm 2018 are the one and only Dr. Demento and Osaka Popstar frontman John Cafiero, producer of the new compilation Dr. Demento Covered in Punk! They will join us during lunch as Kathy O’Connell chats with them about novelty music and more! The lunch buffet will include vegan and vegetarian options as well as a cash bar. Each year in our post-event questionnaire, many folks offer interesting topics to discuss – points they’d like to make or tips/ideas they’d want to share. Some morph their way into a structured breakout session – however others, while just as important, might not warrant an official 45-minute session. With that, in 2016 we created The Kindie Café – held upstairs within the World Cafe Live venue – consider this an open mic night with a twist. Instead of performing, we will encourage you to step up and share your ideas, thoughts, solutions – or perhaps a dilemma that you’d like some input on just how to handle … The Kindie Café will be moderated by Kathy or Robert (mostly to keep traffic flowing) and each person will have up to ten minutes on the mic to share their thoughts. The hope is by offering yet another avenue for folks to interact with each other we can nurture new ideas, solutions and even help solve some of those issues you might be facing as a Kindie performer. The Kindie Café is a work-in-progress but we hope we’ll be able to keep this element as part of KindieComm in the years’ ahead. Click here – or click the SongShare / Kindie Café tab at the top of the page to submit your topic and we’ll do our best to schedule as many folks as possible during this unique platform. While The Kindie Café is underway upstairs, we’ll also be hosting three afternoon breakout sessions elsewhere in the building that you’re welcome to attend. One of the most rewarding round-table discussions at past KindieComm gatherings has been Kindie 101. At each KindieComm we meet more and more new kindie artists; each trying to figure it all out on their own. This discussion will assist in answering many of the questions you might have; from marketing your product, deciding gig paths to travel and how best to brand what you offer and reach that elusive target demo. While this discussion will be moderated, it will be very open – allowing those with a bit more history an opportunity to share their knowledge with others! Being a kindie artist means being an indie artist and at past gatherings we’ve heard from musicians who wished for a dedicated space to chat about home studios. What software works, what issues they’ve faced and what shortcuts have helped them get from raw idea to finished product. If you have a home studio – or are considering upgrading, join us at this discussion. One of the big takeaways from previous KindieComm gatherings was the networking folks made within their greater region of the country. Folks in the Pacific Northwest wanting to learn more about the opportunities in Southern California, for example. Or performers in the Gulf Coast considering a tour of the Northeast. Trying to branch out is a challenge – especially when there is little structure in place to assist. The hope is those who have lots to share about their ‘zone’ will do so in their gathering. Additionally, those considering a trip to a new time zone can sit in on that MeetUp and learn more, ask questions and make connections. It’s what KindieComm is all about. … featuring musicians representing the wide scope of the wonderful world of Kindie! Details on the KindieComm Industry Showcase can be found here. Tickets to Sunday’s public concert are separate from your registration and you can reserve yours ($15 per) when you register for KindieComm. General ticket price is $18 each or two for $30. Also be sure to take advantage of the KindieComm Mailroom – a designated area where Kindie artists can drop off their latest CDs, media kits and more to those Kindie media folk attending KindieComm. This area will be staffed all day long and be equipped with extra pens/paper for those last-minute personalized notes you might want to include with your items. The purpose of the KindieComm Mailroom is to relieve the stress of hunting down every broadcaster and blogger in attendance. By utilizing this free service, everyone can relax and make the most of their KindieComm experience! To those traveling to Philly via Amtrak or the SEPTA Airport Line, you’ll get off at 30th Street Station and exit the building at 30th Street. 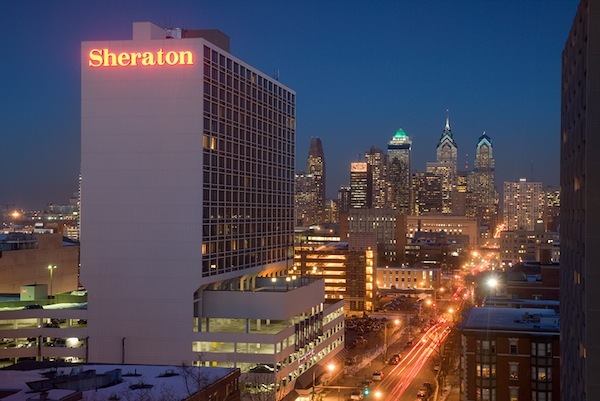 To get to the Sheraton Philadelphia University City hotel (our host hotel), you can either take a taxi or – if the weather is nice, just walk west (up numbers) on Market Street from 30th Street to 36th Street and make a left – go one block to Chestnut and there you are. To reach World Cafe Live from the hotel, just walk straight down Chestnut Street (same direction as the traffic) from 36th to 31st Street. Make a right and enter World Cafe Live via the lower level Donor Alley entrance. Once inside you can take the grand staircase to the upstairs Walnut Street entrance – or simply use the elevator (PRESS 4). If you’re coming directly from 30th Street Station to World Cafe Live, just walk south on 30th Street two blocks to 30th and Walnut Street (dead end) and make a right. World Cafe Live is a half-block in at 3025. Both entrances have signage.